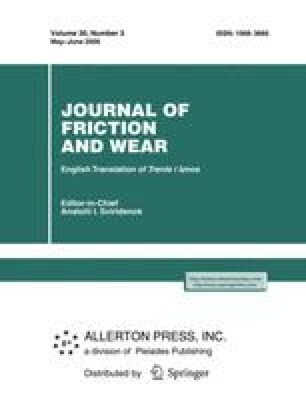 A model of erosion wear at threshold velocities of incidence of abrasive particles is advanced based on the classic theory of dynamic contact interactions and the structural-time fracture criterion. A formula for calculating the intensity of erosion damage is developed, assuming that erosive particles slip over the surface of the target material during contact. The dependences of erosion wear on the angle of incidence of particles of various sizes are plotted. Original Russian Text © I.I. Argatov, N.N. Dmitriev, Yu.V. Petrov, V.I. Smirnov, 2009, published in Trenie i Iznos, 2009, Vol. 30, No. 3, pp. 245–253.